Astronomer Holger Pedersen found some cardboard boxes from the old Østervold Observatory in the basement of the Niels Bohr Institute. The boxes were full of photographic plates with astronomical recordings that go back more than 120 years. 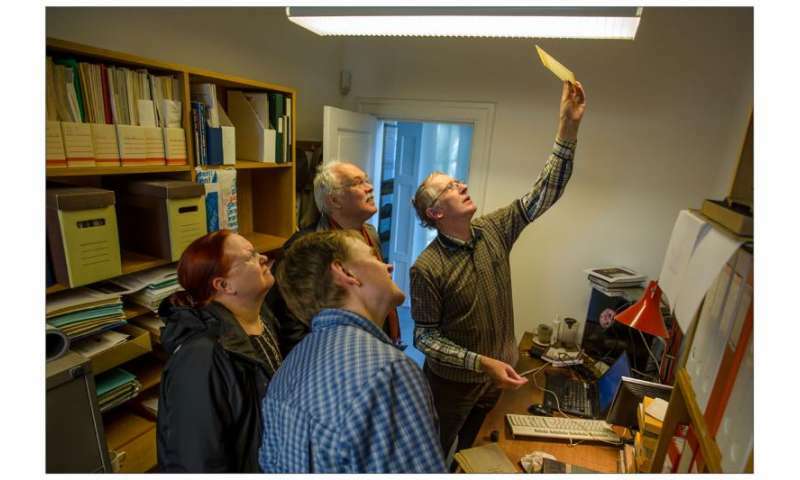 In the basement under the Niels Bohr Institute building on Juliane Maries Vej in Copenhagen they have found astronomical observations that go more than 120 years back in time. 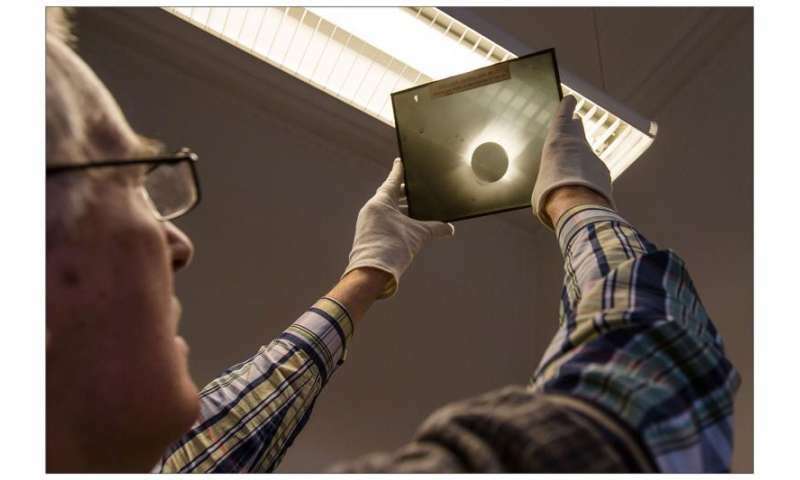 The observations were recorded on thin photographic plates made out of glass and they have been shown to contain footage a solar eclipse that is of particular historical interest. The old observations were discovered by chance by astronomer Holger Pedersen, who is now retired, but is still a regular visitor at the Niels Bohr Institute, where he works on projects. "One day when I went down to the basement to make a cup of tea, I noticed some cardboard boxes from the Østervold Observatory. They had been moved there when the observatory was shut down many years ago. The boxes were full of cartons, so I took them up to the office to take a closer look at them," explains Holger Pedersen. The closer he looked, the more he could see that there were very interesting things to be found. "It is astronomy archaeology," he says excitedly and puts on white cotton gloves before he touches the glass plates. One box contains plates from 1895 to 1897. They are untouched and have lain there untouched ever since they were put in the box. Here is Jupiter from 1896. "It's really the disk of Jupiter, exclaims Holger Pedersen – "how beautiful". There are also quite a few photographs of binary stars. From the records he can see that they were taken by Carl Burrau, who worked at the Østervold Observatory. 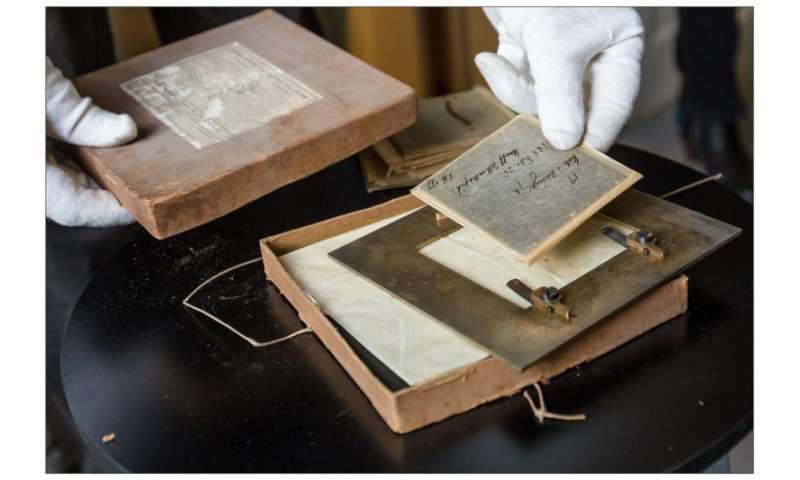 He had a doctorate in experiments with astronomical measuring instruments for photographic plates and both Holger Pedersen and several other astronomers who are following along are amazed at how good the 120-year-old photographs are. "It is astronomy from a different age," exclaims Johan Fynbo, a professor at the Dark Cosmology Centre at the Niels Bohr Institute. He uses the giant telescopes, the VLT in Chile and space telescopes in his research on supernovae, which are exploding massive stars, and he researches galaxies in the very distant universe, more than 13 billion years away. In the 1800s, they had a completely different worldview. They did not know where the stars' light came from, they did not know about galaxies outside our Milky Way and they believed the universe was around 400,000 years old. Since then, it has been an exciting time full of many new discoveries. Seen here is the solar eclipse from 1919, which the English astronomer Arthur Eddington used as evidence for Albert Einstein’s general theory of relativity. The Østervold Observatory building is from 1861 and the telescope is from 1895. In the boxes from Østervold are more than 150 photographic images. Some of the photographs are from the very first years, including a lunar eclipse from 28 February 1896. A collection from glass plates from 1909-1922 show the Moon in various phases. They are very nice images. There is also a plate from 1912 that shows the massive star Arcturus in the constellation Boötes and an image shows the Orion Nebula in the constellation Orion. Some plates from 1921 show the massive star Deneb, which is a bright star in the constellation Cygnus. An image from 26 April 1957 shows the comet Arend-Roland, where you can see its antitail. An article in Nature from 1957 by Fred Whipple describes the comet's antitail. A glass plate from 1919 is something special. It shows a solar eclipse that was recorded in Sorbal in Brazil by the English astronomer Arthur Eddington. He was one of the period's most important astronomers and discovered, among other things, the link between the mass of stars and their brightness and made model calculations of the internal processes of stars. 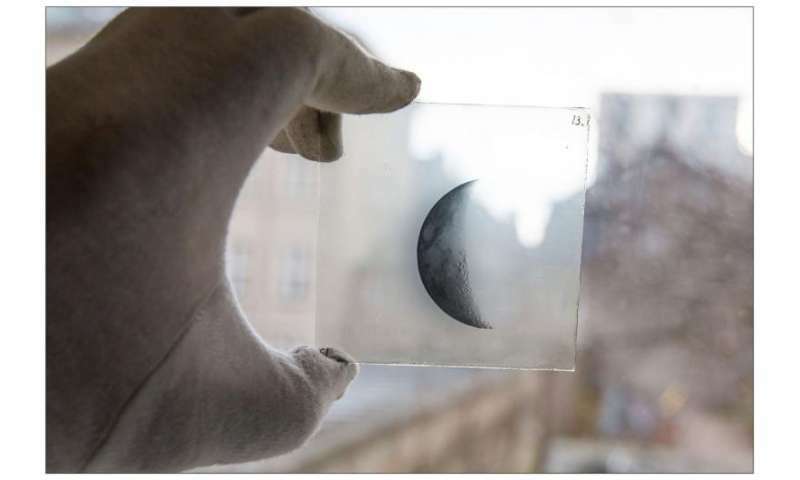 A collection of glass plates from 1909-1922 show the Moon in different phases. In 1915, Albert Einstein had put forth his general theory of relativity, which describes the relationship between space, time, mass and gravity. If the theory was true, it would mean that light from, for example, a distant star passing massive objects – like large stars and galaxies, would be bent by the gravity of the massive objects. The theory was difficult to test, but Arthur Eddington realised that the movements in our solar system could provide a natural cosmic experiment when the Moon moves in front of the Sun and creates a solar eclipse. The next solar eclipse would be on 29 May 1919 and Eddington went to Brazil to photograph the solar eclipse and the stars that could be seen close to the Sun in the dim light. The image was compared with earlier images of the same stars without the Sun in front. The images showed that the Sun's gravity really did bend the light from the underlying stars and this was very strong, reliable evidence for Einstein's theory of relativity. The Østervold telescope from 1895. 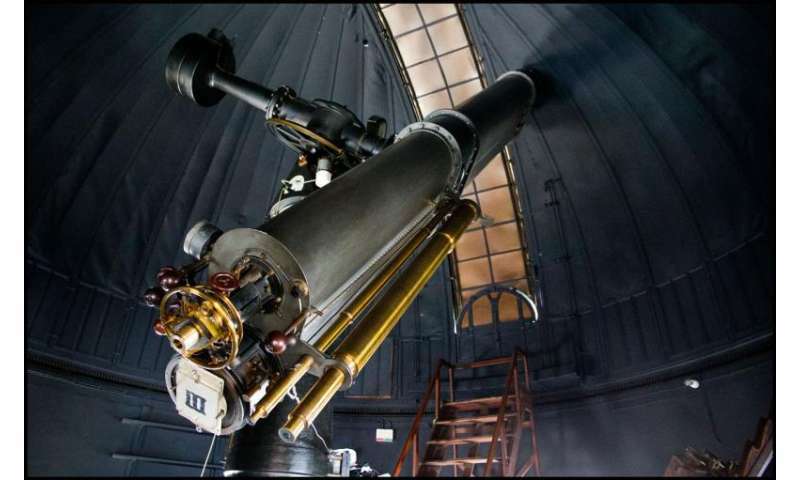 It is a double-lensed telescope, where there was one for visual use and one for photographic recordings on 16 cm glass plates. The glass plates are placed in the grey cartridge and then you look in the eyepiece up to the right. 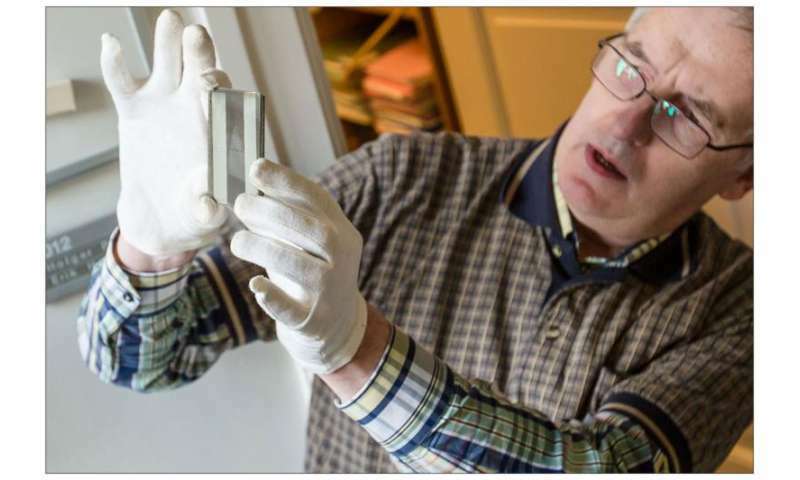 The glass plate from the basement of the Niels Bohr Institute is not the original. But even a copy of the original is rare and historically interesting. Holger Pedersen has made a catalogue of the recordings and is looking into getting funding to have the images digitised for the Natural History Museum of Denmark. A box from 1941 has never been opened. It is heavy, so it is not glass plates. When it is opened, they can see that it is brass holders to set the glass plates in when they are placed on the telescope to make recordings.